Money for "Promoting Him and His Policies." Seoul City Mayor Lee Myung-Bak is under mounting criticism from various civic groups for allegedly forging a "special deal" with conservative vernacular daily Chosun Ilbo. In a statement issued on June 29, 2004 Minonryon or Citizen's Coalition for Democratic Media blamed Mayor Lee for financially supporting the daily in return for its "favorable" coverage of the conservative mayor. They maintained that the Seoul City Administration purchased 5,000 copies of the daily's sister magazine "World Village" at the cost of "taxpayers' money" by the group's own term. As many as eight pages were allocated to a an interview story of Mayor Lee in June 3 edition of the quarterly published by Chosun Ilbo's sister company, Monthly Chosun. 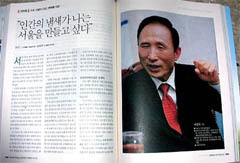 Critics ague that the story titled "Millenium City Seoul" is oriented to promote Mayor Lee and his activities. The Seoul City paid whopping 50 million won (43,252 US dollars) to Chosun Ilbo before it distributed copies to the citizen groups free of charge. Mayor Lee was acquitted of election-law-violation charges by a court on July 7, 2003. He was charged with circulating his election promotion materials to an estimated 91,000 voters before the start of the official campaign in 2002. He cinched Seoul mayorship on the conservative Grand National Party ticket. Another sister magazine "Weekly Chosun" in its June 10 issue ran a lengthy interview story promoting Mayor Lee and his works. Seoul government also bought 1,000 copies of the weekly to distribute them in primary and secondary schools free of charge, as well. In the similar vein, another pro-democracy civic group Munhwayondae or Cultural Action issued a statement on June 28, 2004 to condemn "the special linkage" between power and media. 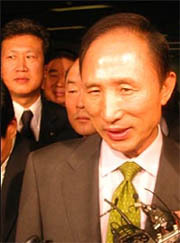 One of its leaders Kim Wan argued "the Seoul City Administration wasted taxpayers' money to promote Mayor Lee and his policies." Both civic groups called on the Seoul City Administration to stop spending tax money for promoting a particular politician and his policies. The Seoul City government has been running huge advertisements on the mass-circulation conservative daily. In return, the influential daily has been "quite favorable" in its coverage of the city mayor, according to critics. Mayor Lee, who is lawmaker of opposition Grand National Party (GNP) is widely accepted as one of the most likely candidates for presidency. Is This A "Capital" Move?